Sheriff Ozzie Knezovich says deputies met with murder-suicide suspect Christopher Henderson the day before the deadly shooting at the Rockwood center. Asking for increased community support for mental health and domestic violence services, Spokane law enforcement leaders acknowledged today that authorities had two recent contacts with the suspect in Tuesday’s murder-suicide at the Rockwood Cancer Treatment Center — at one point seizing his firearm and later returning it to him the day before the shooting. Officials identified the shooting suspect as 37-year-old Christopher Henderson, who they believe fatally shot his wife, Sheena Henderson, 30, at the treatment center where she worked, before turning the gun on himself. 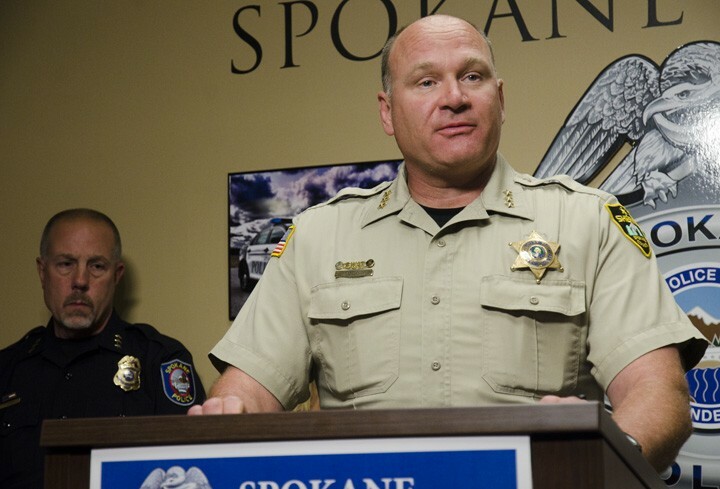 Spokane Police Chief Frank Straub says officers previously detained Christopher Henderson on May 16 after his wife reported he had made suicidal threats and armed himself with a gun. Officers found him sitting in a van with the weapon, but were able to safely transport him to the hospital for a mental health check. Straub says the man spent about three hours undergoing an evaluation and treatment before being released from Sacred Heart Medical Center. His firearm, however, was taken and checked into a police property facility. Straub says the Department of Health and Social Services later filed paperwork to release the weapon back to Henderson. Spokane County Sheriff Ozzie Knezovich, who appeared in a joint news conference with Straub and mental health professionals, says county deputies also spoke with Christopher Henderson on July 7, just hours before his gun was returned to him and just a day before the murder-suicide at the Rockwood treatment center. Knezovich says deputies responded after a coworker reported Christopher Henderson had made suicidal statements to the effect of “not having much to live for” if his wife left him. Three deputies responded and questioned Henderson on his statements and state of mind. Knezovich says deputies were aware of the previous contact with Spokane Police, but may not have known about the status of the seized firearm. He says Henderson gave no indication he posed a danger to himself or others, which left deputies no reason to detain him. “There’s no way they could have a crystal ball to know,” the sheriff says. Investigators report Christopher Henderson entered the cancer center at about 9:30 am the next day, Tuesday, July 8, on the Deaconess Medical Center campus. He shot his wife multiple times and then shot himself in the head. No other injuries were reported. Both Straub and Knezovich called for increased community support for mental health and domestic violence prevention services. Knezovich called out the state government for limiting funding for mental health resources, suggesting they had abandoned the challenge to underfunded local networks. Straub argues Spokane has to stop talking and start acting on these issues.